The Wait is OVER! 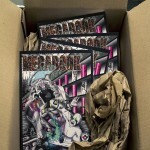 MEGABOOK M4 TPB is HERE!!! | CE Publishing Group! Supersite! I feel as though we just gave birth and want to announce to the world that MEGABOOK M4 trade paperback is HERE! It’s available first on Createspace. Get yours now or if you prefer, you can wait 3-5 days for it to become available on Amazon.com and Amazon.eu. Additionally, M4 will be available on the expanded distribution network over the next 3 weeks. There are tons of distribution networks and stores apparently that we will be learning about. I hope that you all will enjoy these books as much as I do! Thanks for supporting your favorite group of indie comic artists!